Fruitdale High School is located in the southwestern portion of Washington County, Alabama. Fruitdale High School is a kindergarten through 12th grade unit school that currently has an enrollment of 426 students. The school is situated across 25.0± acres approximately 1.5 miles northwest of the Escatawpa River. The school has a series of manholes that collect wastewater from the school campus and route it to a three-cell lagoon system. In 2009, the treatment system began experiencing difficulties in meeting its permitted limits. McFadden Engineering was retained by the Washington County Board of Education to review the existing treatment process and determine options to achieve compliance. It was determined that the existing lagoon system was no longer sufficient to meet the permit criteria. McFadden Engineering began the design of a single pass sand filter to further treat the wastewater of the facility. Single pass sand filters have been used for wastewater treatment in the United States since the late 1800s. They are a viable option as an addition or alternative to conventional methods when site conditions are not conducive for what might be considered more conventional methods of treatment and disposal of wastewater. The sand filter was installed downstream of the existing lagoon system to polish the effluent prior to discharge to an unnamed tributary to the Escatawpa River. The physical location of the sand filter is east of the third lagoon at the high school on the southeastern portion of the school’s property. The system assists in treating the water by filtration, chemical sorption and assimilation. The system’s application area is 42 feet long by 40 feet wide. The Fruitdale High School filter is a deep bed filter with carefully graded layered media. The surface of the bed is intermittently dosed with effluent that percolates in a “single pass” through the sand to the bottom of the filter. After being collected in the underdrain, the treated effluent is transported by a gravity line to the systems existing discharge structure. The sides of the filter are earth berms constructed on a 2:1 slope and shaped from clay material. The inside of the filter is lined with a 20-ml polyethylene liner to contain the effluent and prevent discharge of the effluent via percolation to groundwater. The underdrain is 6-inch slotted PVC pipe and is surrounded by an 8-inch layer of #57 stone with the upstream end brought to the surface to act as a cleanout and vent for the system. A 24-inch layer of sand is laid on top of the layer of stone. 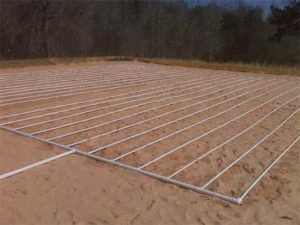 A lightweight permeable geotextile filter fabric has been placed between the gravel layer and the sand layer to keep silt from moving through into the gravel while allowing air and water to pass. To regulate the number of doses to the field during a 24-hour period, a 1,100-gallon dosing tank has been placed in line prior to the pump station wet well. The pump then pressurizes a 1.5-inch supply line and transports the water to a 1.5-inch PVC manifold. The system then pressurizes the 3/4-inch PVC distribution lines and the effluent is evenly distributed over the application area.